While the scope of addition to total income u/s 50C is wide and now happing very frequently,. 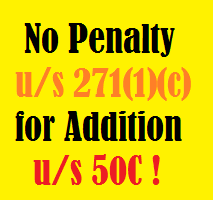 various courts are consistently holding that the penalty u/s 271(1)(c) can not be made for just making a deemed income . Despite this initiating penalty u/s 271(1)(c) for addition u/s 50C of the Income Tax Act recklessly and without even pondering over whether the two primary condition for imposing some penalty u/s 271(1)(c) even present , is very common among assessing officer. Previous articleWhat is The Order Of Adjustment of Carried Forward Loss ! Does Penalty u/s 271(1)(c) include Surcharge and Education Cess ? Who Need Not Fear Cash Receipt Ban u/s 269ST ?